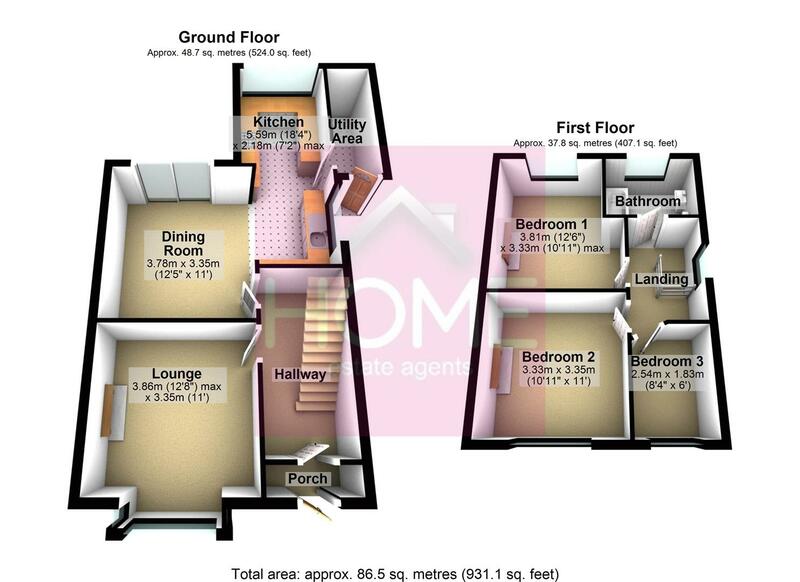 TASTEFULLY PRESENTED THREE BEDROOM SEMI DETACHED !! HOME ESTATE AGENTS are privileged to bring to the market this well appointed bay fronted semi detached property which has been well maintained through out with modern kitchen and bathroom. In brief the property comprises of, porch, hallway, bay fronted lounge, dining room open plan to modern fitted kitchen, utility room, shaped landing three well proportioned bedrooms and a modern family bathroom, to the front of the property is a lawned garden with driveway leading to a car port to the side, to the rear of the property a private mainly lawned garden with patio area and mature borders, the property also benefits from being fully UPVC double glazed and is gas central heated throughout. Positioned close to excellent schools and a short walk from Ashton on Mersey village with excellent transport links including the M60 motorway network. To arrange a viewing call HOME on 0161 871 3939. UPVC double glazed front door with glazed side panel. wood front door leading in, solid wood floor, ceiling coving and double panel radiator. UPVC double glazed bay window to the front elevation, solid wood flooring, gas feature fire place, ceiling coving, dado rail and double panel radiator. UPVC double glazed patio doors to the rear elevation, feature gas fireplace, ceiling coving, dado rail, and open plan to kitchen. UPVC double glazed windows and door to rear and side elevations, large selection grey wall and base units fitted with roll edge work surfaces incorporating a 1.5 bowl sink with mixer tap, electric oven, ceramic hob, stainless steel extractor hood, integrated fridge freezer, dishwasher, led feature lighting, ceiling coving and vinyl floor tiles. Wood door and window with plumbing for washing machine. UPVC double glazed window to the side elevation, open balustrade to stairs, laminate floor and loft access with loft ladder. UPVC double glazed window to the rear elevation, fitted wardrobe, laminate floor, and single panel radiator. UPVC double glazed window to the front elevation, fitted wardrobe, laminate floor and single panel radiator. UPVC double glazed window to the front elevation, picture rail, laminate floor and single panel radiator. UPVC double glazed window to the rear elevation, three piece fitted bathroom suite comprising of, bath fitted with glass shower screen, sink with pedestal, low level w/c, fully tiled walls and floor and heated chrome towel radiator. To the front of the property is a mainly lawned garden with block paved driveway leading to a car port at the side, to the rear of the property is a lawned garden with patio area which benefits from not being directly over looked.